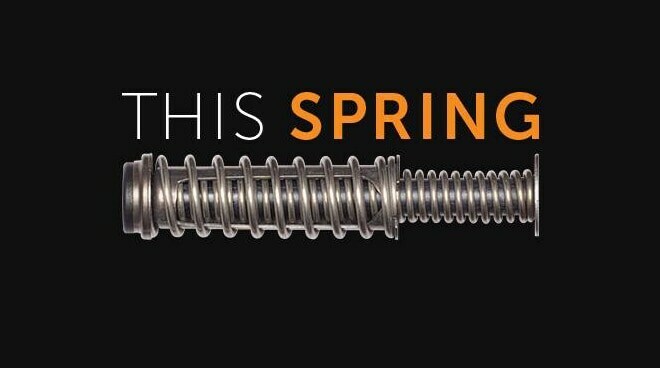 Glock is teasing a new product with a single photo of a recoil spring assembly. Could this be a way of saying get ready for a single-stack 9mm Luger for concealed-carry? Last year the company released the Glock 42, a single-stack .380 ACP pistol for concealed-carry, and it received a lukewarm reception. While there were plenty of Glock 42 adopters, the main issue was–and continues to be–that the company doesn’t make a 9mm pistol in the same basic package. Concealed-carry pistols have been one of the hottest markets for gun manufacturers for a decade following the rise of shall-issue concealed-carry permits and concealed-carry awareness, and Glock, one of the biggest names in service, duty and backup pistols, has been conspicuously absent from the market almost entirely. Since then the company has released several other full-size models including the Modular Optics System, which are race-ready with factory-machined slides designed to accept micro red dot sights. Despite the demand for guns built with optics in mind, many were again disappointed that Glock did not launch a smaller 9mm handgun. The pictured recoil assembly looks small enough for a short-barreled pistol and of course, no Glock is more highly-anticipated than a single-stack 9mm. The wait to find out what this is for, at least, won’t be much longer. Do you think Glock is gearing up to roll out a single-stack 9mm?